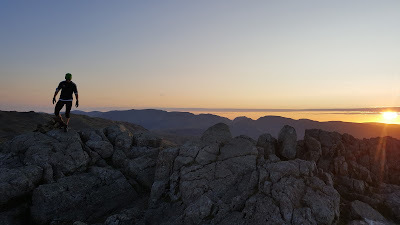 The feeling of standing at the Moot Hall at 20.00 on a Friday night, witnessing the sunset on Skiddaw, stillness of the dark on the Dodds, the magic of the dawn on the Langdales, grit on Great Gable and finally the overwhelming feeling of touching the Moot Hall door 22 hours 26 minutes later will live with me forever! 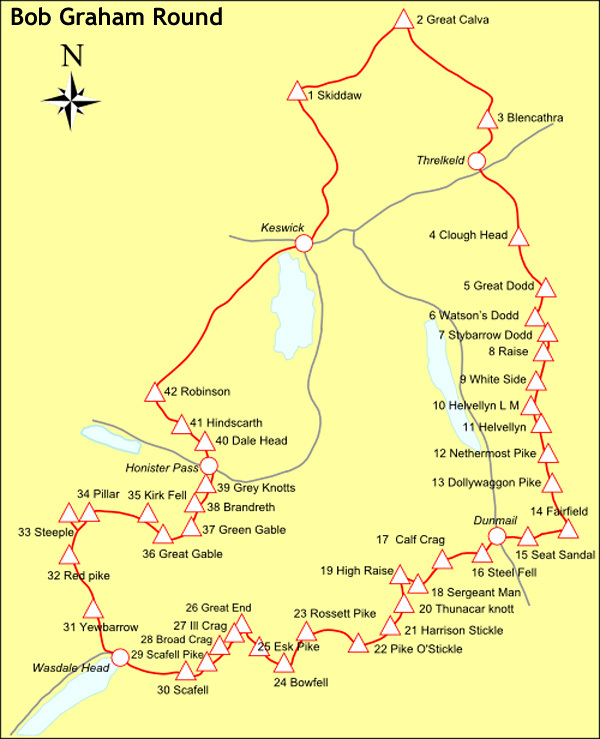 The Bob Graham Round is approximately a 66 mile (106km) route with around 27,000ft (8229 metres) of climbing over 42 peaks in the Lake District. But it is so much more than just a route around the lakes so beware! 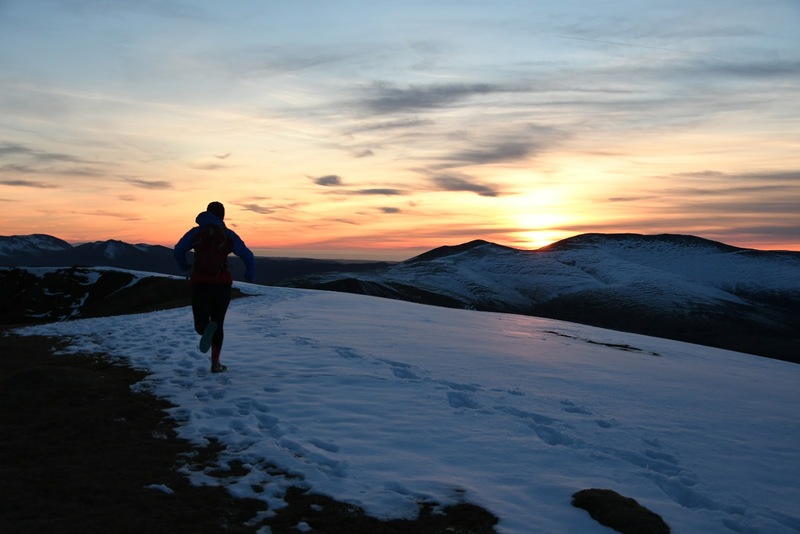 I have always loved to run around the fells because of their beauty, tranquillity and punishing nature! 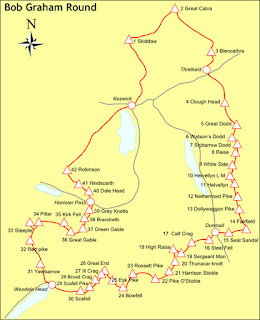 One rainy February whilst on duty on the top yard in school I started to dream of the fells; although this was nothing new, I started to think seriously about the Bob Graham Round and whether I could actually do it..... Being Welsh but living in Cumbria for the last 16 years I felt it had some romantic pull that I could resist no more! After floating the idea with H I had set my mind. I had the agreement from home to commit to it, but more importantly H gave me the belief that I could do it! I did lots of reading about how to prepare. There is lots of advice out there but what I learnt was you have to know yourself and adapt to what is best for you! I had never participated in a fell race or had the intention to, this was about running on the fells, the thing I loved to do. I decided to aim for the end of the summer holidays for my round, and with a date set it became a reality! This was important to me because life can be full of distraction, but I needed to maintain the utmost focus and commitment if I was going to have a chance of completing the BGR. I lived and breathed the BGR from that moment on and my excitement and determination to complete it only grew. In the end I chose the 1st of September so I could have the summer to train (I am a teacher). Although I would lose a couple of hours of daylight, the benefits of extra training, rest and a clear mind far outweighed this. I read lots of blogs and decided to aim for between 30-40 miles a week and 10,000ft of climbing as a training guide. It took a couple of months to be able to sustain this consistently and after a few early niggles I decided to set my training each week based on how I was feeling and what I could fit in between work and family. I never really believed I could complete the BGR until about a month before when I was starting to feel ready, however this didn't matter. 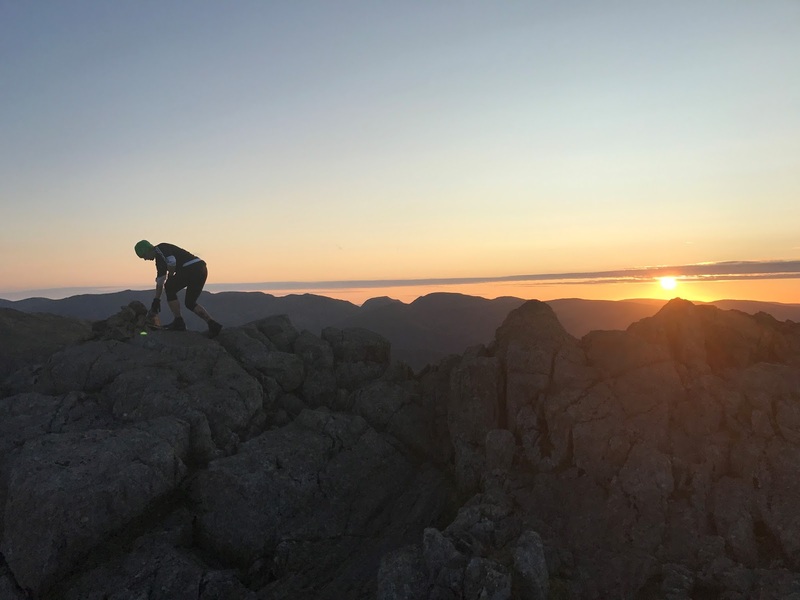 What mattered was I wanted to complete it, the self belief would come on Leg 4 when descending Great Gable I started to allow myself to think just maybe? I decided to book onto a workshop with the inspirational Nicky Spinks (Nicky holds the record for a double Bob Graham). During the day I learnt lots about preparation, planning and other events. By the end of the day not only was I more knowledgeable but truly inspired! February included a variety of runs, mainly on my local fells and one in the Alps in between skiing. There was some rough weather on the Pennines but all good character building. Reading Steve Chiltern's 'The Round- In Bob Grahams Footsteps' was a good insight into the round and a very enjoyable read. Adrenaline flowed as I read the different accounts. Surviving the Cumbrian weather during my training was only going to make me stronger, or so I told myself when battling high winds and snow on the Pennines. A few niggles meant a bit of rest at the start of March so I went for quality rather than quantity. It was also a month for colds and busy school evenings. My running was again mainly local with weekends spent running in the lakes. A variety of Blencathra, High Street and Place Fell routes in the snow made training quite spectacular. When the grandparents visited towards the end of the month I had the most amazing 3 runs with H with a theme of sunsets and snow. I was by now reading Richard Askwith's 'Feet in the Clouds' and started to really get scared, excited and more determined to give the round my best shot. With Easter spent running on the stunning beaches of the Outer Hebrides I was keen to get back out on the fells on my return. 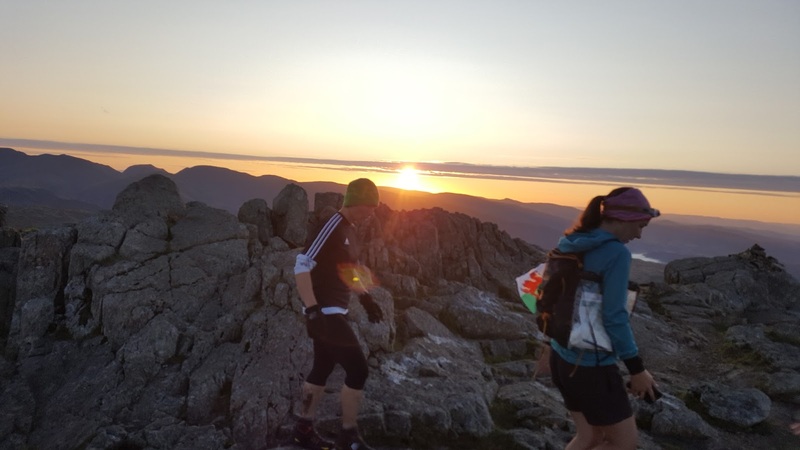 By chance another runner had asked on the Bob Graham Facebook page if anyone fancied joining her for a bit of a recce on leg 3 one evening. I plucked up the confidence to say yes and that was the first time I was dragged around the fells by Jess Richardson. Our chance meeting turned out to be one of the best things to come out of the round for me. We immediately hit it off and started to meet regularly to train together. They say some of the best friendships are formed on the fells and this was so true! My training consisted of routes up Skiddaw, Clough Head and the Dodds, Steel Fell area and my first 20+ miles on my local fells which if I am honest nearly killed me! I knew then I had some work to do! Nothing wrong with a reality check I thought! The beginning and end of May were spent running in Scotland, first overlooking the stunning Knoydart peninsula and the end of May was a bit of flat running on the Isle of Mull. The challenge of training for a challenge is making sure no one else suffers so when the little men want to go to Mull for a holiday then we must go! However, with the lighter nights I was able to train after school in the lakes. This was when I formed the 'SLT' running club with Dave McP (a good friend who also happens to be on the senior leadership team at school). We made a deal to get out each week for a good route in the lakes. For the rest of the term we had some of the best runs and made even better by H, Jess, Domenic and Jodie joining us on numerous occasions. I started running the route more also and this months training consisted of routes around Leg 1 and 2. 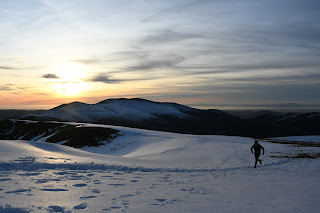 We also ran the Newlands and Coledale Horseshoes which were great training. This was another fun month on the fells with lots of runs spent with Jess, living and breathing the BG. The BG season was well and truly underway with a few attempting it each week. There were a few memorable runs this month from atmospheric cloud in the Howgills to hurricane winds on Fairfield and horizontal hail on the Dodds that forced us back to the car early. After a clagged out Great Gable where we actually lost H and Jodie for a time we were starting to think H was a jinx on the weather. However I don't think she was too impressed that I was coming back with stunning pictures when she wasn't there! She likened us to the Brexit Bus for some reason! At the end of the month I ran Leg 3 and 4 with Mike. Mike is an awesome runner and someone I learnt lots off about managing yourself over long runs. 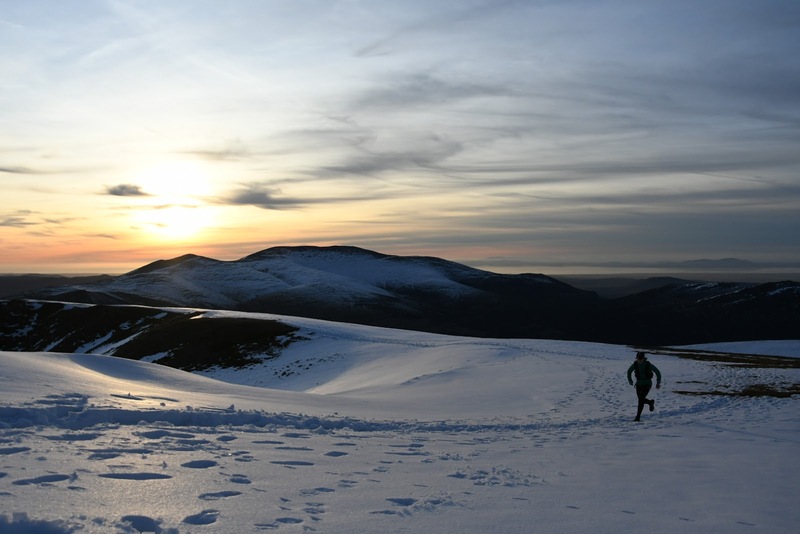 He was training for the Lakeland 100, a race that he would soon finish in the top 20! We had a great 11 hrs on the fells reccing each leg and learning from our slight navigational detours. At the start of this month I was struggling to balance thyroid medication with the demands of my training which started messing with my heart. After a bit of a scare and a trip to A&E I increased my medication and I was soon back on track. This was the month of Jess's BG and we were all getting very excited. I was to support her on leg 1, 4 and 5 on the first weekend of the summer holidays. I learned lots supporting Jess on her BG, about how it was to be organised and also how to get the best out of your supporters. Running into the Moot Hall with Jess, I had to hold back the tears. I was so pleased for her and really proud to have been part of her preparation and round itself. The following week I was off to the Alps for some sun and training on a family holiday. We based ourselves at the foot of Alpe d' Huez and I found a few Alps to yomp up, trying to hit 1000 metres each time at a sustained pace. After every run a dip in the swimming pool with the boys was just what was needed. I mixed my training with a few cols on the road bike and basic strength and stretching exercises (I was usually joined by the little men on the blanket for this - which was quite funny to watch!). The hardest part of the trip was walking 6 hours + around Disneyland carrying the little man who was too scared of the characters! This was supposed to be a rest day! Back in South Wales after the holiday I did a bit of training on the sand dunes to help rest the legs after the impact of the Alps, and then it was the last 2 weeks of hard training before the dreaded taper! On my return to Cumbria Jess had asked if I wanted to support Marcus on his Joss Naylor over Leg 2. Meeting early on the Kirkstone Pass in pea soup weather was a far cry away from 35+ degrees in the Alps! But supporting someone is always so rewarding and again great practice my round. That evening would see me and Jess head for the Howgills to kip in the motorhome before tackling a 25 mile route around the Howgills early the next day. To say it was an epic route would be an understatement! Add in a few detours for cows, severe dehydration, swarms of honey bees and the steep pathless terrain meant we were absolutely spent 9 hours later. However, we both agreed awesome training for my BG! The final week of training consisted of a Leg 2 run with H to work on pace which would prove invaluable on my round and a recce of Lords Rake and the West Wall traverse with Jess and Alex. I originally planned to do Broad Stand but things outside my control meant this was no longer an option. In hindsight this was to prove the best route for me on my round. The boys were keen to go back to the Isle of Mull so my last mountain run would be up Ben More, the highest point on the island. To say it was wet was an understatement but that didn't matter, I felt like I floated up and back and this was a good way to start my tapering. Chilling on the beach with the odd run in between was bliss! However on return I found the lack of hard runs frustrating and the nerves started to kick in! I remember Nicky Spinks saying pick your team wisely based on what you want and need! This was such great advice. I went for 4 supporters on each leg and didn't count people who were doing 2 on their second leg just in case something happened to them. I was lucky to have the support of some of Jess's club members, my friends and a few kind people who answered my pleas on the Facebook page. Not being in a club did not help me here! I was also advised to sort your navigator first as they are really important to have in place! I had 5 people drop out for a variety of reasons so make sure you have a core you can rely on! On road support I had H, my dad, Lou and Lizzie. They were my rocks throughout! After the final bits of organising and chatting through the logistics with the support team I soon found myself standing at the Moot Hall waiting for 20.00. The sun was due to set within the next 10 minutes and the sky was already turning pink. We couldn't have asked for better weather. I only hoped the boggy sections had dried out enough after weeks of rain! Soon we were at the top of Skiddaw having witnessed a stunning Lakeland sunset. 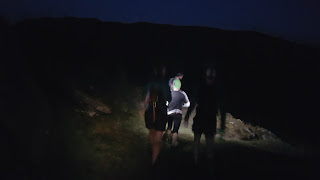 The dark had set in and headtorches were lighting the terrain in front as we dropped down before climbing again to Great Calva. I had 2 Paul's on my leg, one doing a fantastic job of navigating and the other keeping me right on pace. That left Anglea and Lucy who looked after me physically and mentally chatting away and feeding me when needed. Great Calva was soon in the bag and we headed to Blencathra. I started to feel waves of sickness on the climb up Mungrisedale common which started to stress me a little. I was told the BG was as much an eating and drinking game and I was struggling to eat already! I was soon standing on top of Blencathra which is my favourite mountain and started to head down Halls Fell ridge following Paul's excellent line. Half way down I left Paul who went back to check on the others and descended the rest of the ridge on my own. That was the last time I saw Leg 1 support until Paul popped up to see me on Leg 2! I put my eating issues down to nerves and anxiety so had a good talking to myself heading down Halls Fell and this seemed to do the trick. I reminded myself why I was doing this and started to enjoy it! Heading into Threlkeld my road support gave me a round of applause and sent me on my way with my Leg 2 support and a cup of tea. On Leg 2 I had Dave T on navigation, with Dave McP and Tom on food and carry. We headed up Newsham common and I immediately started to feel better and eat. Everything I ate Dave Mcp would finish, which made us a good team - It was so good to have him on this leg as he totally settled my nerves and was my rock throughout (but I'd never tell him this!)! We were soon on Fairfield and heading over the top of Seat Sandal. Dave T had done an amazing job taking me from peak to peak! Road support were once again fantastic! I had decided to stop at Dunmail to dry, powder and Vaseline my feet. This was to prove invaluable as the round went on! Leaving Dunmail with Jess, Mike, Greg and Jim, I knew I was in safe hands! Jess and Greg were on Nav and Jim and Mike looked after me with food and drink! Once Steel Fell was out of the way we were treated to the most amazing dawn as we headed to Calf Crag and beyond. Headtorches were soon switched off and a moment of excitement and elation occurred as the warm sun broke the fells. This was an iconic moment on my round. Having not drunk enough on Leg 1 and 2 I was starting to cramp. 4 litres of water and 3 hours later the cramp disappeared thanks to Mike and Jim! 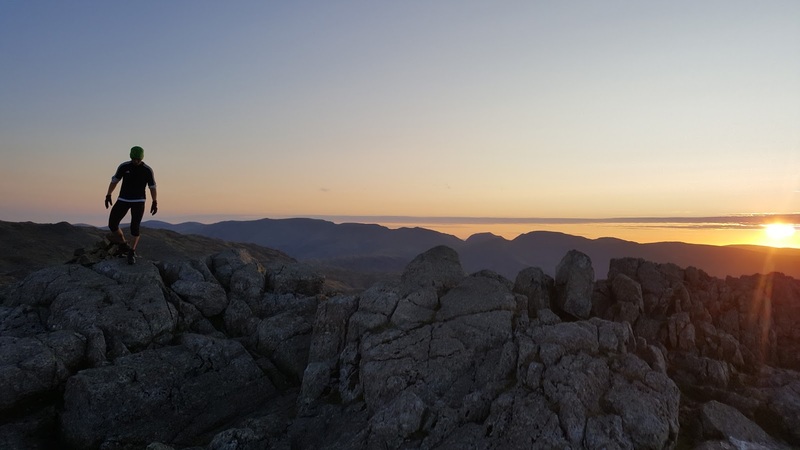 Meeting H on Scafell Pike- Magical! I had asked H and my Dad to meet me on Scafell Pike for a psychological boost! The feeling of seeing them standing there cheering me on was amazing! H ran the rest of the leg with us, her constant commentary up and down Scafell was a welcome entertaining distraction! We headed into Wasdale and once again my feet were treated and I was able to eat the bacon and egg sandwich that H and Lizzie had cooked for me at Dunmail. Looking at the disappointment on Jess's face I think she was planning on pinching this for breakfast having carried it throughout Leg 3 for me! Yewbarrow was always going to hurt but I kept my discipline with my pace and I was soon touching the summit. Jess, Alex, Tom and Matt were looking after me really well. I had a good routine for fueling and it wasn't long before we were scrambling the red gully on Kirk Fell. I was still feeling good and enjoyed the climb up Great Gable where I saw a man who we had met out training completing his Joss Naylor. We exchanged good lucks and headed down and over to finish the leg at Honister. You really can't beat the camaraderie between fell runners! Running down into honister I could hear my boys cheering me on! I had looked forward to this moment since leaving them at the Moot Hall over 19 hours earlier! After a well earned cup of tea and cake I was soon heading out of the car park with my support team. I had always wanted H to finish the round with me as I know I couldn't have even dreamed of doing it without her. Lizzie had agreed to navigate and was another person who had given me such confidence and encouragement throughout the process that I was so pleased when she agreed to run with me. Rosie (Mike's wife and long time friend) surprised me by turning up and running with us! It was great to have another friendly face at the end! Tom and Jim were completing another leg for me and were invaluable in their support throughout. I started to think I might actually complete this but stopped myself straight away. This was dangerous thinking as anything can happen. I made myself just focus on getting to each peak like I had been throughout the round. I was soon stood on top of Robinson looking back at the round as the visibility was incredible! I allowed myself a hands on hips moment feeling quite proud of where I had come from! Not to get too carried away I soon headed down the crags and out of the bottom of the Newlands Valley. Lou was meeting us on the road to finish the leg which was so important to me as I regarded her as my running mentor! The person who always tells it how it is and always gives good honest advice! We were soon running the road section to Keswick which was quite torturous on the feet and legs at this point! I savoured every step as we headed into Keswick and finally allowed myself to think I could do this! My boys were waiting to run with us as we hit the final section. Navigating the scaffolding I soon touched the Moot Hall door! I had dreamt of that moment on every training run for the last 8 months! A huge thank you to friends who turned up to see me finish and all the people watching my tracker, Tweets and and Facebook posts and sending messages of encouragement and support. It made the experience all the more special! And a final massive thank you to all my support team and family for making a dream come true! Earn as many brownie points at home as possible all the time! You will need them for the amount of commitment needed! Choose your support team wisely. What do you need? Who do you need and when? Who will calm you down on Leg 1 and who will not put up with your moaning on Yewbarrow! Put a provisional date in the diary and go for it! Unless you're wanting to beat the record Lords Rake and West Wall Traverse is great and does not lose much time or cost energy! It is also a fun way up! Choose your kit wisely and practice with it- Salomon high gaiters were a god send throughout, keeping bog out as well as supporting and protecting ankles and keeping feet warm! I ran with a Petzl Nao + head torch with the belt kit; It was awesome and lasted leg 1, 2 and what I needed on Leg 3. Practice eating and drinking during training runs and don't try anything new on the round, stick to what you know. I liked to eat ready salted crisps and banana malt loaf. Whatever works for you! Look after your feet in training and on the round! Vaseline worked its magic! Not one blister! Recce the route and know your pace! Get your pace right and the rest will follow. Before your round try and sleep, I found this difficult but get something to take your mind off the round, tapering is harder than the training itself if you get bored easily and can't sit still! Find someone who is as crazy as you to train with! Train to feel! The fells are punishing so rest and recovery are just as important! Savour every second, the journey was just as fun and fulfilling as the destination!